3 Bedrooms, 2 Bathrooms, plus sofa bed- Sleeps 8. This absolutely gorgeous home is located in the heart of the South Florida Gold Coast just a mile from the beach, close to several major malls and a limitless choice of great restaurants. Imagine relaxing with your favorite beverage while you watch the boats parade by on the picturesque Cypress Creek waterway. Then take a refreshing dip in your private, sparkling pool (with optional heating) before working on your tan on one of the sun lounges. The entire home has recently been remodeled with all the latest comforts and top of the line upgrades. The gourmet kitchen features granite counter tops, custom cabinetry, all new appliances including convection toaster oven, blender, coffeemaker and even a wine cooler. The family room/ kitchen area opens to the relaxing lanai and pool deck where you can watch boats on their way to and from the intracoastal waterway and the ocean. Fish from the private dock with gear and tackle provided for your enjoyment. 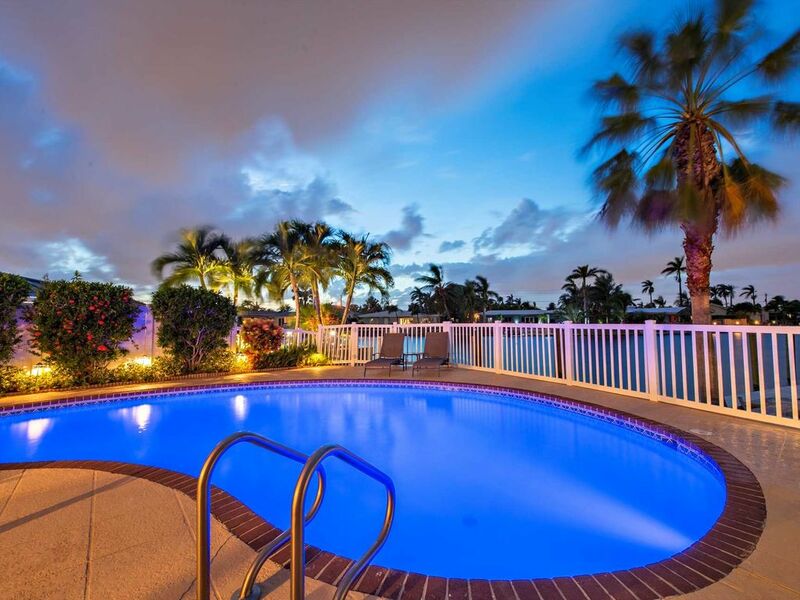 The full size heated pool and expansive deck is the ideal setting for family fun in the Florida sun. The home also features a living room with all high-end leather furniture and is equipped with HDTV and DVD/VHS/CD player, DVD/CD library plus stereo receiver. The stereo also has outside Bose speakers in the lanai for your enjoyment. The master bedroom which opens to the lanai and pool deck has a new king bed, ensuite bath, vanity and HDTV. The second bedroom features a queen bed suite with HDTV and DVR plus large closet. The third bedroom has twin beds, large closet plus an HDTV with DVR and both are located on the side of the home opposite the master bedroom. The family room has a queen sleeper/sofa and a business desk that folds out from a large wall unit complete with laser printer for your laptop. Two adult bicycles and several children's bikes are also provided for exploring the neighborhood. Children's toys and games for all ages is another plus for booking our home. Directly on an ocean access waterway: The home is situated on Cypress Creek waterway and is just ten minutes from the intracoastal by boat (at idle speed) with only one fixed fifteen-foot bridge. Bring your own boat or a rental is available close by. You are truly in the best of both worlds with the ocean and beaches only minutes away while enjoying the comfort of a large luxury home on a quiet cul de sac. Managed and maintained by the local owner, this meticulously kept property is absolutely the best value in the area (check out our over 80 five star reviews). Make this your choice for a wonderful vacation full of fun and relaxation in beautiful South Florida, the Venice of America. Our property management company, Covenant Property Group was founded several years ago when it became apparent that many families were tired of paying higher and higher prices for vacation accommodations. Since then the luxury home vacation rental business has virtually exploded around the globe. South Florida, which has always been a destination for vacationers, has experienced a demand for home rentals that is unprecedented. Covenant Properties has grown to become one of the larger, well-respected property management companies in the area. We offer quality, luxury homes to the families that are looking for a home away from home at reasonable rates and managed professionally. These homes or villa apartments are typically one to five bedrooms, most with upscale amenities such as a pool, waterfront and near one of our pristine beaches. The properties provide a wonderful venue for families that are tired of the typical resort they would have to share with many others that may or may not be considerate those around them. Our goal is to have all of our guests have a great time experiencing the closeness of friends and family with none of the downside. Our mission is to provide accommodations and services that exceed the expectations of our guests and to make their South Florida experience one that is filled with cherished memories. Our first guests are still our friends and it has been the same with everyone we welcome into one of our homes! We have many guests that return year after year which tells us that we are continuing to succeed at accomplishing our mission. If you would like to know more about how we can help you plan an absolutely perfect South Florida vacation please feel free to contact us. Jan & Tom Brain, property managers Covenant Vacation Rentals Call us today at 954-562-0835. This particular property is our own home and we have recently remodeled it entirely. Only the finest high-end materials and fixtures were used in every room of the home. The kitchen is spectacular with all custom Kraft Made cabinets, granite counter tops, indirect under counter lighting and tumbled marble backsplashes. The floors are all procelain tile or in the bedrooms, top quality carpeting. The furnishings are new such as the all leather living room, dining table and chairs, the bedroom suites and the DISH HDTV entertainment center. The pool and deck area overlooks a wide waterway where boats can be seen cruising by on their way to the ocean. This is truly the home in which to really experience the South Florida lifestyle. "COVENANT MEANS "FIVE STAR PERSONAL SERVICE!!" Everything is done to ensure that your stay will be comfortable and relaxing. Upon arrival you will be greeted with our signature "Welcome Basket" filled with fresh fruit, coffee and muffins. The home is furnished with everything from kitchen and cleaning supplies, bathroom toiletries such as shampoo, conditioner and body wash to beach towels, beach chairs and even sunscreen. We've thought of everything so you don't have to! Leave your cares behind and enjoy our unique hospitality along with the sun, surf and sand! WELCOME TO THE COVENANT VACATION EXPERIENCE! Both baths have been remodeled with custom cabinetry, marble counter tops, porcelain tile and highest grade fixtures. Toiletries such as shampoo, conditioner, body wash, shaving needs, TP and even traveler's toothbrushes with toothpaste are all provided. Everything from sunscreen to shampoo has been provided for you in order to make this a vacation you will always remember. We provide brochures on nearby activities as well as menus from our favorite restaurants. The house comes with WiFi and internet access and we supply beach chairs, a cooler, and a beach umbrella for those sunny days on the sand. A pack n play and/or high chair are available on request. This is truly a home away from home but one that also reflects the South Florida lifestyle. We do have a minimum age requirement of 30. Also pool heat is an option at $20/day. Beautiful home with everything our family needed! As so many reviewers before have stated, Tom and Jan's home is perfect for families. Everything is clean and in working order. The pool/beach toys, bikes, and fishing poles made our kids' vacation dreams come true, and all of the upgrades and amenities in the home made it a breeze as a parent. The location is close enough for a quick trip to the beach, and a short drive to many other activities. We would definitely recommend this home to any family looking for a relaxing and easy vacation. Great house with beautiful views. Very comfortable and well stocked. Just returned from a fantastic break in Cypress Lakes. From the basket of fruit and muffins on arrival to the large selection of toys made available for my toddler, nothing was forgotten. There was even shampoo and sun cream. The property was very spacious with a lovely pool area overlooking the lake, where it was lovely to watch the sunset and also the boats driving past. The property was well situated with restaurants and shops close by. I would not hesitate to stay there again and look forward to returning. Thanks to Denise for her very complimentary five star review. We are always pleased to hear our guests had a great vacation experience in our home. The house is on a nice quiet street situated on a cul-de-sac. Upon arrival, there was a welcome sign on the kitchen counter along with a welcome basket filled with fruits, muffins and a bottle of wine. I rent through VRBO many times a year and the welcome basket was a first! The house was in a very nice neighborhood and the property was beautiful, located with a gorgeous view of the intracoastal, a true backyard paradise. My passion is cooking and the kitchen had everything you could ever want, including spices, condiments, etc. The owners could not have been any more accommodating. We called with a few questions and they immediately responded. We needed a late check out and they were able to accommodate us. I would highly recommend this property and next time I go back to South Florida, I would look to stay here again. Very nice property, 100% as advertised I would absolutely recommend it to anyone! Very nice property, 100% as advertised I would absolutely recommend it to anyone! Very nice and accessible owners as well. Our family had a wonderful vacation at this property. Very well furnished and stocked with everything you might need....and more 😊Thanks Jan and Tom. Highly recommended for a So.Fla getaway. Pompano Beach is just north of Fort Lauderdale, the Venice of America. Water and the tropical warm weather is the theme here. From waterparks to one of the best beaches in Florida, we have it all. Close by are golf courses, tennis courts, shopping malls, boat rentals, scuba/snorkeling, deep sea fishing, Everglades airboat rides, surfing and of course swimming. Many entertainment venues are here such as the theaters, casinos and all kinds of sports - Florida Marlins baseball, Miami Dolphins football, Florida Panthers hockey & Miami Heat basketball.